Classic! Sure, there’s lots of pieces but well worth it. Thank you so much for this pattern, it has been on my quilting bucket list for many years and now I might actually get to do one. The double wedding ring shall live on forever. Glad you found the pattern useful and good luck with your project! Thanks so much. This exactly what I have been looking for. I am 76 years old and hope I have time to make it. This will be my carry along with me project. I love it. I made one when I was 16 and it is in bad shape. 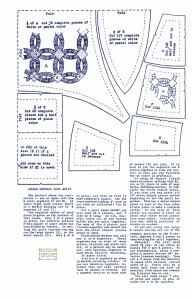 The last paragraph lists how much yardage is needed to complete the quilt. Typically this pattern is made from scraps but you could divide the yardage into dark, medium and light values if you’re not using scraps. i’m one of those people that needs to know how much of fabric i’m going to need, but I don’t see that anywhere. do I just use scraps or FQ or what. completely confused. I know this sounds odd, but it’s just how I think. There is mention of 56 of the A-template for a quilt 86″ x 99″ so it stands to reason that the “cut” number on each piece would yield this size of quilt. Good luck with your project! i am looking at doing this and i am trying to find the finished size in the information somewhere and can’t. can you please tell me how big it is when finished. also can you tell me if it says somewhere in the information how many exactly of each peace you are meant to cut? The double wedding ring is an oldie but a goodie! This is the exact pattern that I used to make my Double Wedding Ring quilt. It had belonged to my mother or grandmother and was so old and fragile that I had to photocopy it before I could make my templates. I print them as is. Thanks so much for sharing this quilt pattern. I am a long time quilt maker and anxious to try this one. By my calculations, the pattern equates to a 12″ block so in order to size it up, you’d need to enlarge by 150% for all the pieces. You may have to take it to a copy shop unless you have a printer/copier with enlargement capabilities. I don’t know what the finished size is and yes, it could be enlarged. You could cut the pieces from paper and lay them out to see what size it is, then adjust accordingly. How large is one round with this pattern? I’m needing a large round (ring?) for a table topper. Could you enlarge these to make the right size? Thank you so much for this. I have been thinking about making one for a while but thought it was too complicated. After reading the PDF I realised, although it’s time consuming, its much more straight forward than I had imagined. Now I have a purpose for all those scraps ive been keeping! 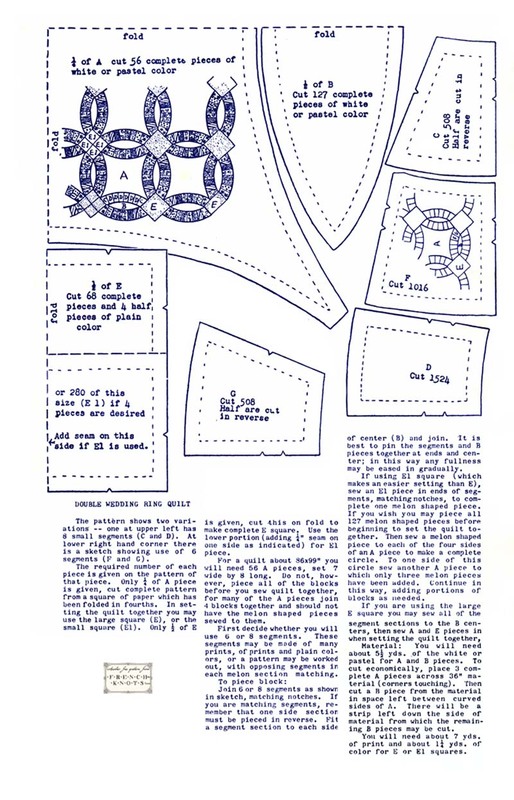 Mary, the pdf file is sized to print out as an 8-1/2 by 11 page so the pattern pieces will scale correctly. In Adobe reader you can zoom in to make the text easier to read and you may be able to print the directions with the enlarged text. Hope that helps! I just wish the writing was bigger. I’m having a really hard time reading the directions.